The Space Shuttle Atlantis has finally lifted off from Cape Canaveral to begin its 11-day mission to the International Space Station (ISS). 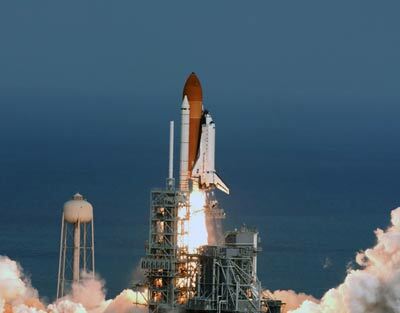 The launch of STS-122 has been delayed since December with fuel sensor malfunctions causing trouble for NASA. In the last few days weather worries looked as if they too might delay the launch yet again, so it is fantastic to see the shuttle riding a column of fire and smoke again! One of the main roles of STS-122 is to deliver Europe’s Columbus module to the ISS – a laboratory for doing research science on the space station built by the European Space Agency. I had hoped to be at the Columbus mission control in Oberpfaffenhofen near Munich when I was in Germany for the original launch date in December. I was really disappointed at the delay of the launch then but now it’s great to see, some months later, Columbus finally take off into space. It’s Europe’s biggest contribution to the ISS and should see the research capabilities of the station blossom. The module will be attached to the station during the course of the mission (hopefully during the first of the three planned spacewalks). It will be interesting to see the science coming back from the ISS. If you want an idea of what research science might be possible in space Chris has an interesting post on his blog.